This week has been really great so far. I dropped a lot of weight right away, but the scale hasn't budged in three or four days. I'm trying to be patient and trust the process - my body is probably just adjusting to the quick loss. Low threes! So close to saying goodbye to them - this time, for good. I will weigh myself tomorrow, my usual Friday recorded weigh-in, but then I am going to step back and, again, try to trust the trainers and trust the process. I know I am being active, I know I am eating well - I don't need to check the scale every single morning to know I am doing the right things. It's hard. I've weighed myself daily for as long as I can remember. But again, I've been doing a lot of things to try and be healthy that were not, in fact, healthy at all. On Tuesday, Dana gave me a breakdown of what I submitted for a sample day of eating, compared to what I should be eating. She showed me my BMR - "the number of calories the hospital would give you to keep you alive if you were in a coma," she said. The meal plan I had submitted was 600 calories lower than that. 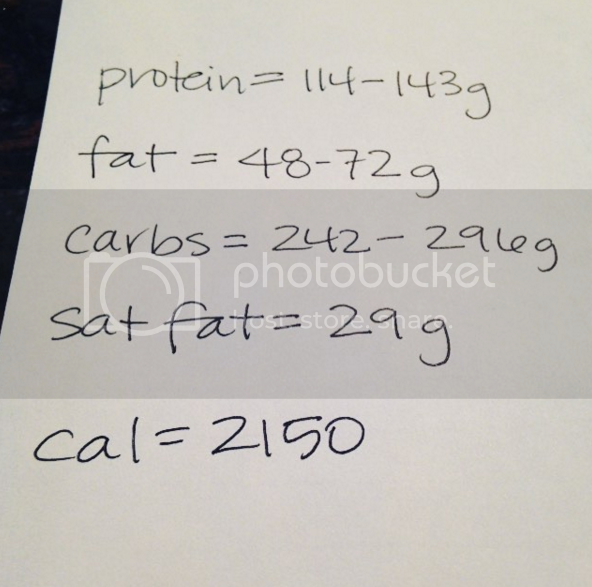 A few calculations, and she showed me how many calories to eat daily to maintain my weight, and then subtracted 500 calories to get a 1-2 pound weight loss per week, depending on my level of activity. She also broke down the nutrients to give me a precise goal for those. That floored me. To eat 700 more calories a day and still manage to lose weight ... I am struggling to wrap my mind around it. We are meeting again today, and I will ask her what goal is more important to meet: the macros, or the calories. I've stuck to my cleaner eating plan - I did a lot of prep cooking and the sectioned lunch containers helped a lot. I've also been tracking as best as I can on MyFitnessPal, with which I have had varied success in the past. It can be very useful, as long as I don't get obsessive about it. It shows the breakdowns for the macros - I've been doing well with getting protein and fat in my target range (and with keeping saturated fat well below it), but carbs have been very low compared to my goal (150g is the highest I've been able to get it), so I am trying to add in more fruits and higher-carb veggies (I had mashed potatoes last night that I made with actual potatoes and not cauliflower!). But the calories are still low - the highest I've been able to get to while keeping the macros in the goal range is about 1700. She suggested adding in oatmeal or brown rice, and again, I need to trust her and not the voice in the back of my head that is telling me no, you can't eat that, it's bad for you. One thing we discussed on Tuesday that I've been really mentally wresting with has been the idea of a cheat meal. "Not a cheat day, just one meal and a dessert," she said, and she added that it helped her stay focused during the week because she knew she'd have that to look forward to on Friday night. And I really panicked after she said that, because I struggle so much with "just one" of anything. It isn't always like that - sometimes, I am more balanced, and I can handle little treats. But right now, I explained to her, I don't know that I could stay in control with it. She understood, and I love her for that. She's been in my shoes, and she said she struggles with keeping certain foods in the house, too. She said when she does her off-plan meals, they're always out at a restaurant or someone else's house. That way it's a unique experience that happens, and then she moves on - physically, and mentally. It's a good idea, in theory. But I'm struggling with it. I'm coming from a place of obsession, where I restrict and restrict and then binge on everything I've avoided. I'm trying to find a place in my life for these things so the binge/restrict cycle ends. The biggest problem for me is mentally, now and always. I told Dana too, I love working out, I love exercise. But the food, and the mental stuff surrounding it - that's what gets me. That's my Everest. And I believe her, and I trust her. And I want to keep trusting her, and myself, and the plan. I say it all the time, now it's time to believe it: it is so, so hard - but it is so, so worth it. I love reading your posts. I'm still cheering you on over here in California. I wish we had more time to hang out while you were here. We battle the same demons and could have game planned together. I want to give both you and Dana just the biggest hug in the world. I agree with Dana about the cheat meal being less of a cheat and more of an indulgence and not being something at home sounds about right. I know it has to be a little bit harder to do something like that with the kiddo, but what if you had a nice meal while at work when he was already in daycare?